Minister Jacinda Ardern of New Zealand meets with Muslim community leaders after the Parliament session in Wellington on Tuesday. 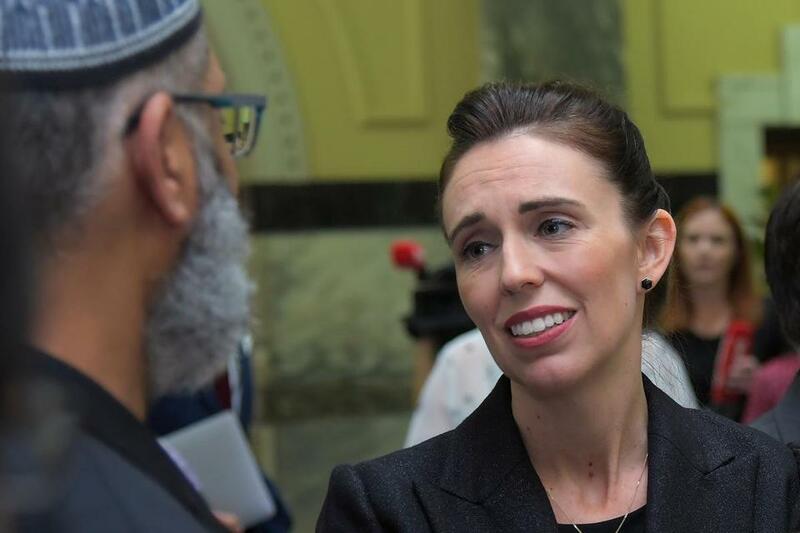 Ardern vowed never to utter the name of the twin-mosque gunman as she opened a sombre session of Parliament with an evocative “as-salamu alaykum” message of peace to Muslims. This is the kind of laudable leadership on gun legislation our own nation has been sorely lacking for decades. Yet examining the “why” of this atrocity — the bigotry that spurred it — deserves just as much urgency as regulating the objects used to carry it out. White extremism is as potent a weapon as the firearms used to slaughter Muslims as they prayed in their mosques. As a nation mourns, as 50 victims are buried, as dozens more struggle to heal from their wounds, attention must be paid to the white supremacist hatred that fueled this craven attack. New Zealand is only the latest target of an insidious belief infecting the world that the existence of those perceived to represent a threat to white dominance — people of color, Jews, Muslims, and immigrants — must be extinguished. “These are people who I would describe as having extremist views that have absolutely no place in New Zealand and, in fact, have no place in the world,” she said. Yet such repugnant views have found purchase everywhere, especially in the United States — and it’s not just about President Trump’s election. Between 2008 and 2017, more than 70 percent of murders blamed on extremism were committed by white supremacists or members of far-right groups, according to the Anti-Defamation League. Before 11 people were murdered at a Pittsburgh synagogue last year, six people were shot to death in 2012 at a Sikh temple in Wisconsin in what police called a “domestic terrorism-type incident”; nine African-Americans were murdered at a South Carolina church in 2015 by an avowed white supremacist who hoped to spark a race war. This roiling racist discontent helped put Trump in the White House, and the violence has spiked each year of his presidency. Last year, the ADL recorded at least 50 murders from extremist violence, most of them carried out by far-right disciples. That’s a funny way to refer to your base, Mr. President. Then again, it’s not a small group of people, and Trump’s far-right support reaches beyond America’s borders. Without question, laws are needed to keep weapons meant for war out of the hands of civilians. In response to the massacre, some New Zealanders have voluntarily turned in their semi-automatic rifles. Certainly if not for such weapons, fewer people might have died at those mosques. Yet the suspected shooter’s hatred of Muslims and immigrants still would have found another way to violently manifest itself. Whenever there’s a racist crime, leaders often say, “This is not who we are.” That disassociation is as false as it is knee-jerk. They can’t really address this plague until they own that we live in societies where white supremacy is tolerated, political, institutional, and systemic. With radicalization only an Internet connection and a few clicks away, white supremacy at its most extreme is out of the shadows and into the streets. Any leader unwilling to speak forcefully against it, and the violence its adherents encourage, has blood on their hands, their complicity as lethal as a bullet.